As promised, today we reveal the third and final segment of our meal delivery service series. If you have yet to settle on trying either of the last two services we’ve reviewed, then we feel pretty confident that the segment today will help you decide on one that you will truly love! If you’ve been following along with our Meal Box Review Series so far, you know by now how much we have loved both Terra’s Kitchen and Dinnerly. We loved them so much, in fact, that we’ve moved from research clients to actual clients, eagerly awaiting our boxes filled with delicious and pre-planned meals for our families each week. But as you surely know, there are so many more meal box options out there for you to choose from. There are diet-based options, vegetarian plans, and some even centered around just meat (yes, it’s a thing). Some are wildly popular and well-known, touted by celebrities and Hollywood endorsers, and some are smaller players in the game with loyal, yet decidedly less famous followers. With so many on the market it’s still hard to choose, so we decided to help a reader out and give a quick run-down on some of the popular boxes out there. Still not ready to try a full un-boxing? Then we’ve got something for you too. Blue Apron is one of the most well-known and highly advertised meal boxes out there. We’d be remiss to leave them out! A pioneer in the game, Blue Apron is a well-run machine. They have a great variety of recipes, and as a foodie I can definitely say I’ve learned quite a few things from following them over the years. The variety really pushes you outside of your comfort zone in the kitchen, and it’s fun to try new cuisines and flavors in the comfort of your own home. The only downside is that it’s hard to feed a family with picky kids with a Blue Apron box. Perfect for young couples who aren’t trying to feed mouths that prefer hot dogs and chicken nuggets above all else, Blue Apron is a safe and dependable player in this field. Calling themselves “America’s Most Popular Meal Kit”, Hello Fresh meals start at around $8.99 a serving. This is comparable to most meal kits, though for a family on a budget that quickly adds up. The meals, like Blue Apron, are fresh and there is a wide variety with classics like meatloaf, and meals to stretch your palate like poblano tacos. Their packaging gets rave reviews for the ease: it’s sorted by meal with all ingredients together in well-marked bags, and it’s sustainable, using all recyclable materials. If the masses are correct, this is the meal box to try. The recipes seem straight forward and get great points for flavor, so if budget isn’t a consideration, Hello Fresh might be the best option for your family. With so many meal-kit services on the market it’s hard to choose, so we’re giving you a quick run-down on some of the popular boxes out there. The meal kit for organic lovers, Green Chef uses only USDA certified organic ingredients in every recipe. Their recipes are varied and fun, allowing you to choose from 10 different dietary preference-based menus. Love Paleo, and wondering if they’ve got it? Is it gluten-free? You’re covered here too. They seem to market mostly for two-person households, with only two-family options (omnivore/carnivore). A bit on the pricey side, with meals averaging around $12/serving, this is a meal box for people who are passionate about their ingredients and their diets. “The Perfect Cooking Experience.” This is what Plated sells. Quality ingredients. Flexibility of choice. Ease of planning. What’s not to love? Plated is a bit lesser known than some of the competition, but the quality and passion behind the plan isn’t suffering from a lack of fame. By foodies for foodies, their recipes are fun and inspiring. The ingredients they use are among the freshest on the market, and the plans are highly customizable, allowing you to choose the number of servings and the number of meals you want to receive each week. Like Green Chef, quality comes at a price and this service is a bit on the higher side, around $10 per serving, but it appears they deliver on what’s promised and are a great option for the foodies among us. Not ready for a meal box commitment but desperately need meal planning help? Enter Platejoy. Not a meal box but a menu plan, this service takes your preferences and habits and creates a tailor-made menu and shopping list each week. Yes, more work than ingredients showing up at your door; however, there is more flexibility with a Platejoy plan, which works for many people. There’s a meal plan for literally everyone here, even the batch cookers among us, and the meals seem fun and easy to follow. Getting rave reviews from followers and bloggers alike, Platejoy just might be the place to start in your meal box journey. No matter what your preference for a meal box is, there’s something out there for you. Give one of these a try today and let us know how you like them. We might even give them a try ourselves if you’re a big enough fan! 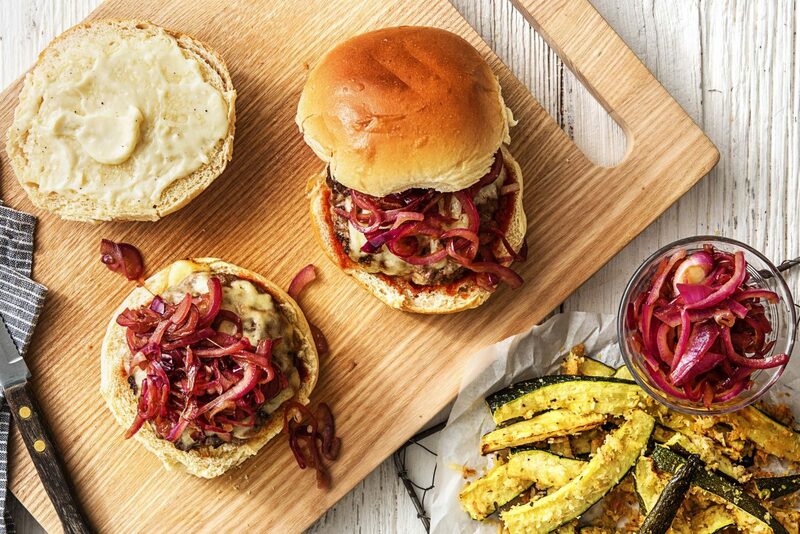 Feature image from Hello Fresh.